We had a great time away last week. 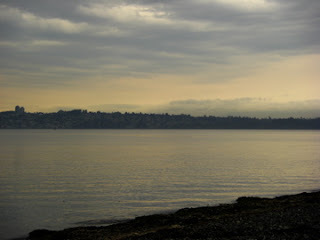 The first several days were spent at Semiahmoo, where Erik was attending a conference for work. Even though he had to attend meetings and workshops, it was so much nicer to be there with him than home alone with the kids, and we had plenty of time with him too. 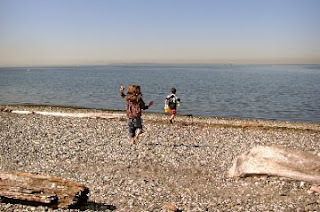 The kids enjoyed exploring the beach, finding rocks and shells, and breathing lots of fresh sea air. We also had a very nice visit with Stacy and her sweet family one day. After Erik's conference was over we headed North to Vancouver, British Columbia, where we spent the next two nights. The weather was cool and rainy, but we enjoyed walking around the city and seeing some of the sights. I was born and raised in Canada and always feel nostalgic to revisit my home country. Even though we're close neighbors, it really has its own feel, and it was good to be there again. The kids enjoy the beach. The view from Semiahmoo, looking across the bay into Canada. A few little Poppy-isms as of late: She confidently ordered "official chips please" off a menu one evening. It was the fish and chips she was going for! Another evening she enjoyed a "girl cheese sandwich." Today she found a woolly bear on our walk, and kept referring to it as a "gummy bear"! We're slowly getting school underway. I'll try to write more about what we're doing this year soon. Peregrine is officially kindergarten age this year, so it's our first "real" year of homeschool and so far we're enjoying it. Raphael is six months. Half a year. Precious. And can hardly wait to go fishing with Daddy. I've long wanted to start keeping a nature journal and make it a family project. Drawing, however, is not one of my skills. But I know it's something I can learn along with the kids, so I've been doing some drawing with Peregrine, following the instructions in his Draw Write Now books. It's actually fun, and has boosted my confidence enough to pull out an old blank notebook and make my very first, of hopefully many, entries! It's a very humble beginning, but a beginning it is. First entry in the Nature Journal: the Woolly Bear. Next up: a pin oak leaf and acorn gathered on our walks, and maybe this spider and her supper of wasp. I'm glad they arrived! Thank you for reading my blog, and for playing! 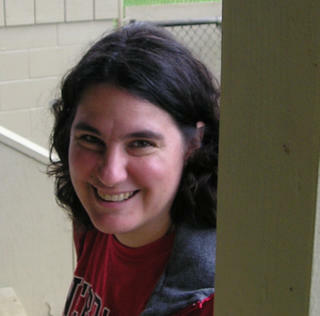 Rebeca, so glad you enjoyed your time away. A change of scenery does wonders for the heart, doesn't it? We, too, are in Seattle while Craig works, enjoying time with him that we wouldn't get to have had we stayed home. Draw Write Now is on my list of 'wants'. Please consider posting a review; I'd love to hear your thoughts on it! Always good to visit you here! Bless you, dear friend, fellow momma and sister in Christ!!!! A Girl Cheese Sandwich, that is super cute! oops - posted this on your 9/29 post by mistake so I'm cut & pasting it here now :) gives me a chance to edit typos too! I love the idea of having a master plan/schedule - would be very helpful to me. And I think your idea of a nature journal is delightful!